In the cell immunotherapy, the monocytes or stem cells are extracted and collected from the body of a tumor patient, and then transformed into immunoreactive cells (e.g. NK, DC and CIK cells) through the in vitro separation, induction, culturing and additional antigenic stimulation; and after the accumulation to an effective amount and the strengthening of target identifying function, such immunoreactive cells are transfused back to the body of this patient, so as to break the immune tolerance of body and eliminate the cancerated or aberrant cells. Dentritic cell (DC) is the antigen presenting cell of strongest function in body. It can identify and treat various exogenous antigens (e.g. pathogenic microorganisms and in vivo antigens (e.g. mutant or aged cells) and then transmit the antigenic information to T cells for activating and mobilizing the immune response of body, so as to eliminate the antigenic substances and maintain the stable balance in body. Just like a police dog in body as the metaphor of a certain scholar, DC cells monitor the immune system of body all the time, so as to guarantee the internal stability of body. The tumor is a disease caused by the abnormal proliferation of cells due to their gene mutation. In the normal body, the immune system can identify/kill the mutant cells through the cytoimmunotherapeutic mechanism, and then eliminate them before the transformation into tumor cells. However, in the tumor patients, there is a hypofunction of immune identification (especially the DC identification and antigen presenting) and even DC cells can not be identified sometimes, so that the tumor cells are not eliminated through the immune systems. In the DC immunotherapy, the DC cells of a patient are amplified to an effective amount through in vitro induction and culturing and also activated through the tumor antigen to restore their ability of identifying/treating the mutant antigens; then these activated DC cells are transfused back to the body of this patient to mobilize the body immune system for tumor elimination, so as to greatly improve the anti-tumor ability of body. Cytokine induced killer cells (CIK) is a group of heterocysts obtained after the in vitro joint culturing of several cytokines for a certain time. CIK cells possess various advantages, e.g. fast proliferation, high tumoricidal activity, broad tumoricidal spectrum and no MHC limitation. CIK cells can automatically identify the tumor cells, and then specifically kill them and eliminate the foci. 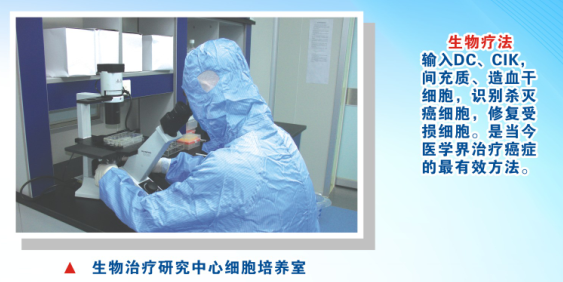 As the surface marker of CIK cells, NK-T cells can not only kill the tumor cells in a non-specific way like NK cells, but also kill them in a specific way like T cells. After the transfusion into body, NK-T cells can release various cytokines (e.g. IL-2, IL-6, IFN-γ and TNF) to induce the apoptosis of tumor cells, and also release some substances (e.g. porforin and Fas) to directly kill the tumor cells. (1) As a systemic treatment, it can strengthen and mobilize the immune function of whole body (but not of a local part). (2) As an invasive treatment, it does not damage the normal cells or internal organs, so as to effectively improve the efficacy of radiotherapy or chemotherapy. (3) With a broad tumoricidal spectrum, it can completely eliminate the tumor cells out of body and effectively restrain the recurrence/metastasis of tumors. (4) At the combination with TCM medicines, it can consolidate the essence and cultivate the primordial qi to overall upgrade the function of various organs, increase the immunity of body, improve the survival quality of tumor patients, and prolong their life.